New York (TADIAS) — With PM Abiy Ahmed’s tour in DC ending with a public gathering at the Walter E. Washington Convention Center and a town hall meeting on Saturday, July 28th followed by a visit to Los Angeles, CA, he is now scheduled to greet the Ethiopian Diaspora community in Minneapolis, MN. The Mayor of Washington, DC Muriel Bowser has proclaimed July 28th, 2018 as “Ethiopia Day in DC” in celebration of PM Abiy Ahmed’s visit to the U.S. capital, which is a sister city of Ethiopia’s capital city Addis Ababa. “Now, during this new climate of goodwill and unity, we look forward to reaffirming the Sister City relationship between our two capital cities,” Mayor Bowser said. Organizers of the Los Angeles event have also shared that an “Ethiopia Day” proclamation was presented on behalf of the City Council on July 29th, 2018. 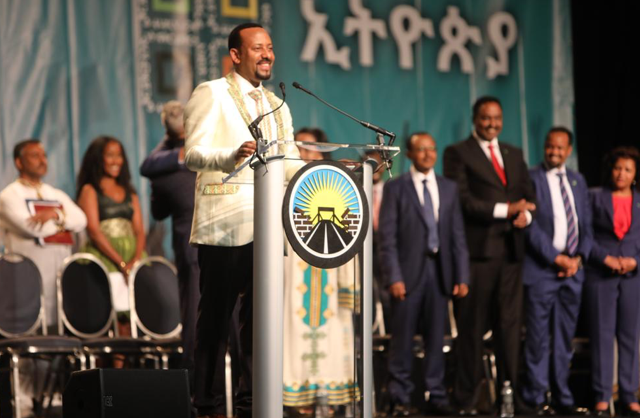 Below are images from PM Abiy’s address at the Walter E. Washington Convention Center on Saturday, July 28th as well as the evening town hall meeting.